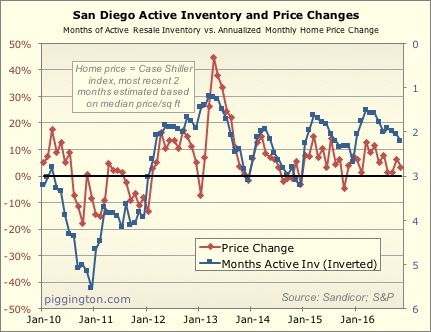 Here are the two data points on my favorite (non-valuation) chart, which shows months of inventory inverted in blue, and monthly price change in red. 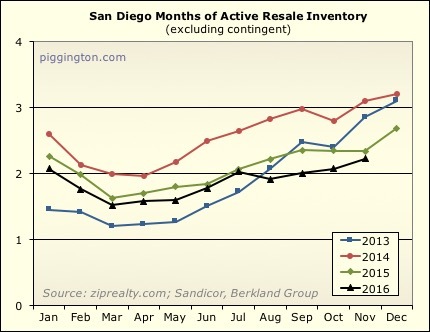 The inventory will likely increase next month as it always does (see first chart), but that seasonal head-fake aside, we are still at supply/demand levels that have typically been associated with increasing prices. Thus far there doesn't seem to be too much damage from the spike in rates (which while very sharp, hasn't been that big -- basically taking rates back near where they were at this time last year). 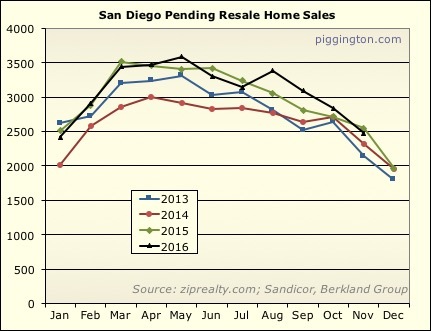 This chart of pending sales doesn't show any significant decline in demand beyond the usual November drop. Submitted by gzz on December 13, 2016 - 12:17am. Thanks I've been looking forward to your update. 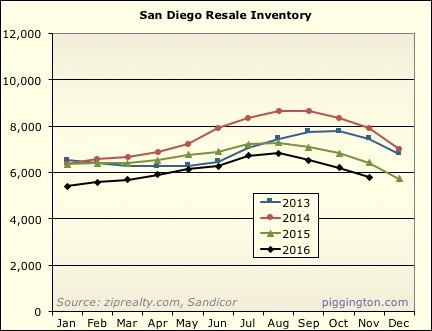 Resale inventory less pending may be the most accurate measure for our purposes since big developers only list a few units at a time typically, even if they have hundreds for sale. Submitted by natesactm on December 13, 2016 - 2:13pm. Thanks Rich. I keep tabs on 92104, 92102, 92103, 92116 using PropertyRadar. Your data jives with what I've been seeing on there. 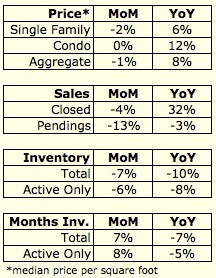 The inventory levels are constrained, but most buyers are still winning with very strong offers (20%-100% down). Still too early to see the effects, if any, of the recent interest rate spike but I'll be looking forward to updates in the new year. Submitted by Rich Toscano on December 14, 2016 - 1:44pm. Submitted by gzz on December 14, 2016 - 3:45pm. Oh I assumed months of active included new construction on MLS and months of resale excluded it. Submitted by asitl on December 21, 2016 - 4:52pm. 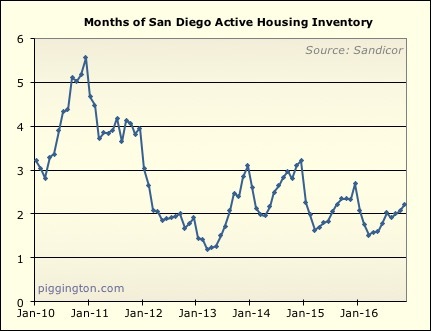 One would expect a downward trend in price with the rates rising, however, with inventory so constricted it's anyone's guess where the equilibrium will be. Submitted by FormerSanDiegan on December 22, 2016 - 12:43am. 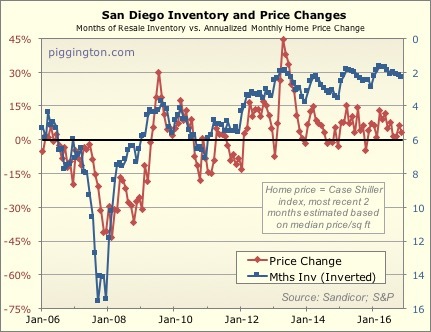 Prices do not necessarily move opposite the direction of mortgage rates. In fact, historically in periods of significant sustained increase in rates, prices almost always have risen. 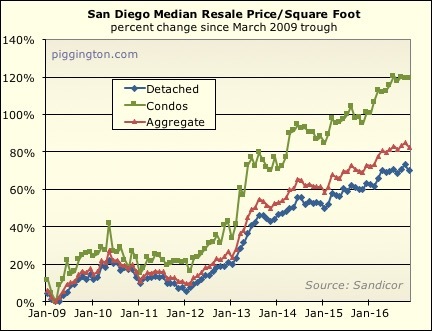 Although there are some periods of declining rates and increasing prices, I have not been able to find any evidence of significant periods of price declines that correspond to increasing rates. But maybe this time it's different. 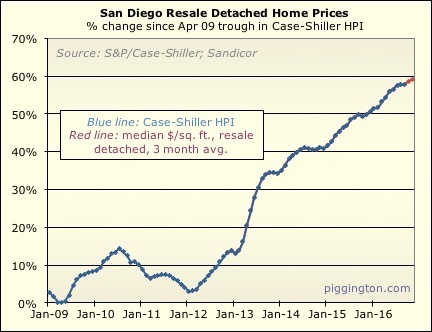 IN CA median home prices moved from ~25K to ~100K. 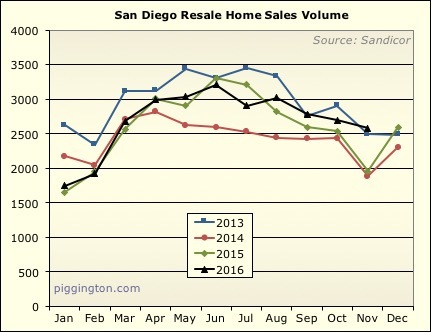 CA median prices increased form about 178K to over 500K. Submitted by Escoguy on December 24, 2016 - 2:36pm. Not all rates are going up. 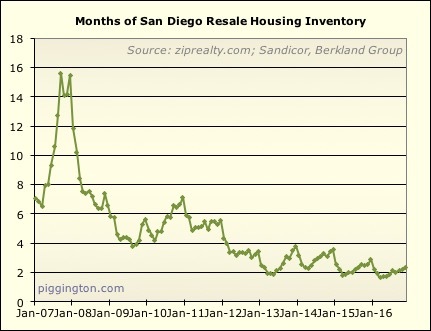 It is one of the key variable rate indexes in California. I know this may seem counter intuitive with the 10 year going up, 30 year fixed rates up by 70 bp and the Fed raising short term rates, but their has been a discussion that banks/mortgage lenders have been over charging by about 80-100 bp on loans vs historical spreads in this period of low rates. I.e. when the 10 year was 1.37% earlier this year, this best loan you could get was 3.1% on the 30 year which was a 1.7% spread vs a historical 1%-1.3% spread. So if the historical trend had held, one could have gotten a 30 yr for 2.5-2.7% but that didn't happen. Given the devaluations in the yen/Euro in the past couple of months (post election) may help to jump start the European economics/Japan some but with the trillions in negative rate securities, US debt will seem more appealing to investors with the discretion to put money in US fixed income. I remember buying my first home 16 years ago in California, mid 2000, the stock market was peaking and there was a clear downtrend in tech stocks. Some seasoned real estate brokers told me when the stock market tanks, that historically funds have been directed to real estate and that turned out to be true. I think if rates stay below 5% on 30 year fixed mortgage (70% probability is my guess), then prices will rise at 1-3% per annum for the next few years. 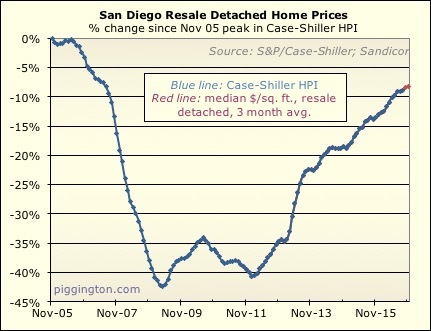 Rates at 6% would likely cause prices to go negative. Submitted by gzz on December 24, 2016 - 9:36pm. I thought there were Fannie policy changes that permanently raised the spread. In any event, inventory is so low prices can only increase. 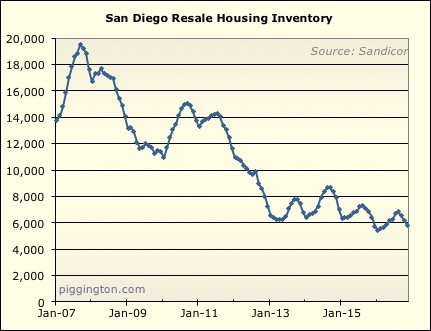 Given the strong economy and nearly all investors are renting for a profit, I see no selling pressure. 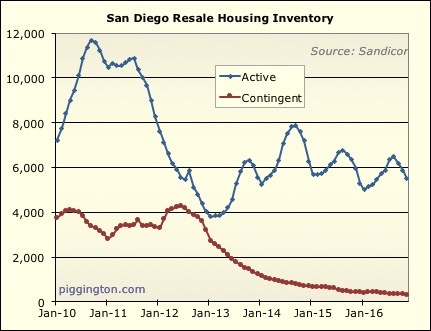 Just more and more people who want to live here, plus rich Asian and NorCal buyers who think San Diego is still a bargain. While we are up sharply from our low, most peer cities have gone up more. We also have run out of new areas to develop. Lilac Hills is an hour from civilization and even that won't be developed. 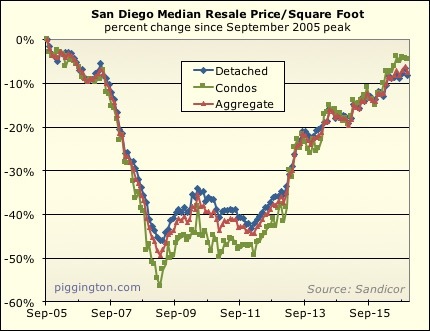 The low hanging infill opportunities were taken in the bigger 2000s bubble. Submitted by spdrun on December 25, 2016 - 9:46am. (1) The volatility since 2007 makes zero sense in the context of population. It's never "different this time." 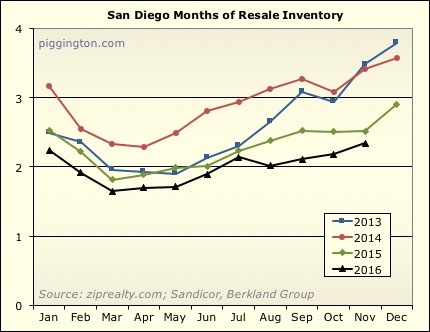 (2) Inventory is only low because there's pressure to buy. 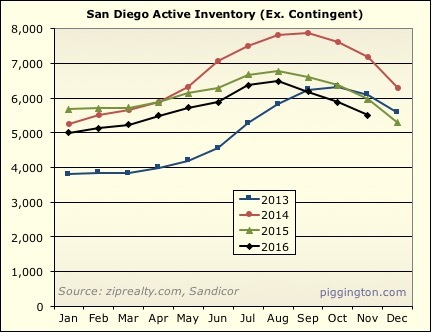 If prices go flat, inventory will also increase since there will be less urgency to buy. Submitted by gzz on December 26, 2016 - 6:23pm. In 2007/2008 the cost to own was way higher than to rent, and we were headed into the worst economic decline since the Great Depression. I don't think prices have been volatile since the big fall. There was one bear market up and down move resulting from large buyer tax incentives, then the real bottom after those expired, then nothing but increases since about Dec 2011. I posted one year ago that I expected prices to go up 7-10%, and 12 month YoY is 8%. I will guess for 2017 5 to 8% increase. Inventory level and unemployment are more bullish than one year ago, but rent increases have moderated and we are at a higher base, so I do not think 2017 will be quite as good. Submitted by gzz on December 26, 2016 - 6:33pm. One other bullish inventory-related point is the stock of renovation flips will be much lower in 2017 than even a year or two ago. I track every single 92107 listing, and the percentage of listings that were purchased and renovated over 3-6 months has never been lower. They might have peaked at around 25% of listings and are now under 10%. This stream of nicely renovated houses with unemotional sellers motivated to sell by financing costs will soon all but disappear outside of estate sale flippers. You might call these "son of shadow inventory" as many flips started as short sales or REOs. Submitted by spdrun on December 26, 2016 - 10:15pm. You're assuming that we're in normal conditions, which we're not. With any commodity, people assume a new normal which often doesn't exist. Remember when people said that we'd NEVER see $50/bbl oil again? Submitted by asitl on January 3, 2017 - 3:49pm. In none of those instances were the rates at historical lows and prices at historical highs/above bubble levels.